My 10-year-old was shocked to learn there are teenagers who are homeless. Both brothers worked hard to fill cups of laundry detergent. "I attended the Doing Good Together event in Bloomington [MN] this weekend. My boys and I truly enjoyed it. My 10-year-old was inspired to help homeless teenagers. He kept filling containers of single-serve laundry detergent. I think he single-handily filled all of the cups next to him! (My 8-year-old is on the other side filling the containers.) Both enjoyed the event, and we engaged in rich conversations about helping those in need. They both felt empowered to make a difference in the lives of others." 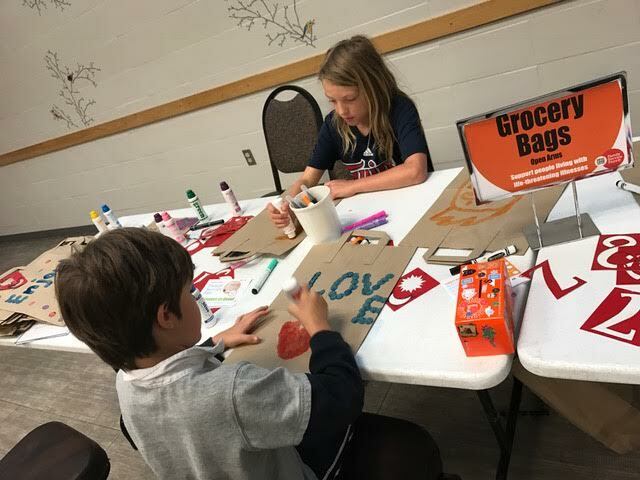 Brothers worked together to decorate grocery bags which will hold items for the local food pantry. DGT Family Service Fairs allow participants to share smiles and kind thoughts through cards. Big News: We "Ponied Up" for Locks For Love! Big news flash from the our Household: Last week, Mia and I "ponied up" and cut our long locks off together! This all came about when I bought the book Doing Good Together: 101 Easy, Meaningful Service Projects for families, School, and Communities by Jenny Friedman many months ago. I asked Mia to read through it and find projects that interested her. 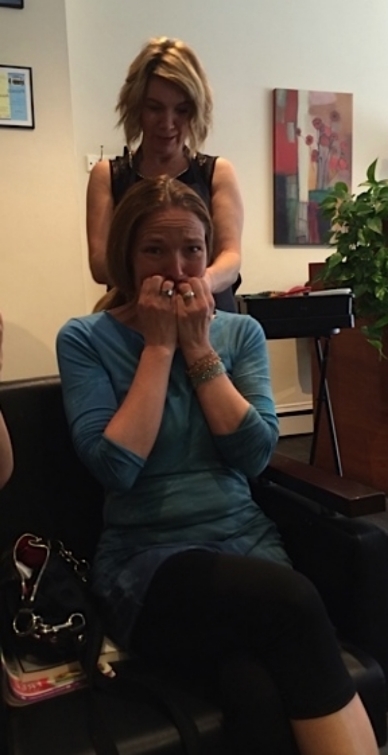 She chose Locks for Love (a hair donation program that makes wigs for cancer patients.) In theory, it sounded like a great thing to do. It was something that I'd always admired that people did, but I was not totally disappointed when she said she wanted to put it off until after school was over. I was also not disappointed when a month before school ended she announced that she planned to wait another year. I hadn't cut my hair short in nearly 20 years. I wasn't quite ready for a drastic change - or so I thought! As we were driving to the hair salon for a "trim", Mia announced that she was ready to "cut it all off" and was I in? "Could we please do it together?" she asked from the backseat. How could I say no? Now the Boston Coordinator for Doing Good Together™ (the organization), it was my "duty" to make this commitment to family-service real. And I really wanted to do it together and have fun with it. I was relieved that I hadn't been given notice on this big decision because I would have given it far more attention and angst than the decision deserved. Instead, this was far more spontaneous and fun...and it best of all, it was a SECRET! Even Bob (my husband) didn't know. I wondered out loud if I should call him to tell him ahead of time and the girls both shouted "NO!!!! Don't tell him!!!" This was clearly a girl-power thing we were doing. No permission was required - or at least that was what I was told by my wise 8& 9 year old girls. And just as surprised as I was by the fact that we were doing this, so was my hair stylist Phil. She is a lovely woman from Ireland who had told me about a similar program by Pantene called PonyUp. They took 8" of hair (instead of 10") and the rumor from the hair salon was that they used more of the hair than other programs. Less hair required, more hair used - sold! She laughed when I told her that we were doing the "big show" that day. She pulled out her brand new ruler that she had JUST BOUGHT the day before. Destiny was dancing with us right there in the salon. Because my hair is so thick, she made two pony tails. She measured carefully and cut quickly. Zoie documented the whole thing. Chop chop and we were done! Mia had to patiently wait for her turn but hers went just as smoothly. And after some styling, we both walked out with a very new look and a great sense of pride and connection - and perhaps, just a little bit more courage. A woman's relationship with her hair is a complex one. I found it refreshing to shake that relationship up. I think I'll be doing this again soon (1/2 inch per month according to Phil...16 months perhaps?) and next time I'll do it with both girls. The tails are in a padded envelope en route to Pantene. We hope they find their way into a few fabulous wigs. Meals on Wheels has been a wonderful hands-on volunteer experience for our family. Our boys are 3, 5 and 7 so it’s very age-appropriate as well. Not only do they enjoy delivering the meals but since we deliver in our own neighborhood (most homes are less than a mile from our house) they’ve come to understand that we have neighbors in need. We drive by a couple homes en route to our 3 year old’s preschool and he’s always quick to point out “There’s Ailene’s house!” I’ve also explained to the boys that they may be the only kids that these older people get to see so I think that also makes the experience more special for them–and helps them understand the reason for the big smiles on the recipients’ faces when we arrive with their meal. Another perk for them is the bowl of suckers at the Meals on Wheels site and the warm greeting they always receive from the staff there. I am a person who dreams of winning the lottery and handing out bags of cash to all my favorite charities. I want to host a fundraiser that raises millions of dollars for those in need. I get overwhelmed because I can’t do this so I do nothing. Until Doing Good Together. The ideas for simple, meaningful, impactful projects have motivated me to do more. We compiled a “12 months of giving” list and posted to our fridge. Each month we commit to doing a project (each found on the DGT website). We are only in February and my 5-yr-old is already asking when we are going to do our second project and she knows what that will be. She’s excited, she’s engaged, and she’s learning. We’ve already had great discussions about what our helping can do, what it means to those receiving and all that we gain from doing it. We aren’t doing the grandest gesture, making the unbelievable gift, but we are changing the world.